Have you found your body is a bit out of shape after winter and not quite ready to run or walk the Bellevue 5k All in for Autism race? Want to get back to feeling your best with some exercise so you can join our team for the event? Often times the first step we see patients take when getting back in shape is to work on their endurance. Running, walking, rowing, hiking, biking or any number of great endurance activities are popular around Bellevue. Adding in exercise that increases cardiovascular capacity is an essential piece of fitness, but we want to help our Bellevue community get back in shape without pain or injury. That said, here are some fun tools to effectively work into your endurance workouts. 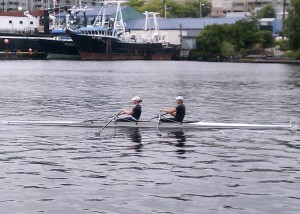 Dr. Cummins rowing out of Seattle’s Pocock Rowing Center. Long Day: Do any cardio activity at a moderate pace to increase your endurance. Having a long endurance day in your plan will push your body past it’s original max. Speed Day: Be sure to work in some speed into your workouts at least once a week. Speed doesn’t have to be an all out effort. Speed can be in the form of simply pushing faster than your normal pace for a short time and then resting, repeating a few times through. If you are a walker, try to walk fast during one block and then walk moderate the next. Do this for 6-10 blocks and you have added in a speed component. Tempo workout: Workout at a steady, moderately hard intensity for the entire session. Your goal is to increase the amount of time you can move fast. For a walker, you can start off with a 5 minute walk to get going and then walk fast for 20 minutes (the Tempo part). Finish off with 5 minutes more of a cool down walk. Change it up: Be sure to add in an exercise that is different than your norm at least once a week. If you are a runner, try hiking, the elliptical, stair climbing, swimming or hopping on the bike. Rest: Don’t forget the power of the recovery. Be sure to include a rest day to your workouts and to aim for 7-9 hours of sleep each night. Endurance is an essential piece of health and putting time in to increase your body’s capacity to move is well worth it. Just remember, fitNESS! This principle from The 100 Year Lifestyle maps out that for whole body health, we need not just to get in our endurance, but to incorporate proper Nutrition, Endurance, Strength and Structure. Skipping a piece of this all around fitness plan may leave your body out of balance and ready to break down – just when you are trying to build it up! For help when your body does break down, chiropractic may be just what you need. Give us a call and Dr. Cummins can see how to best help you move past your injuries and pains to meet your fitness goals.